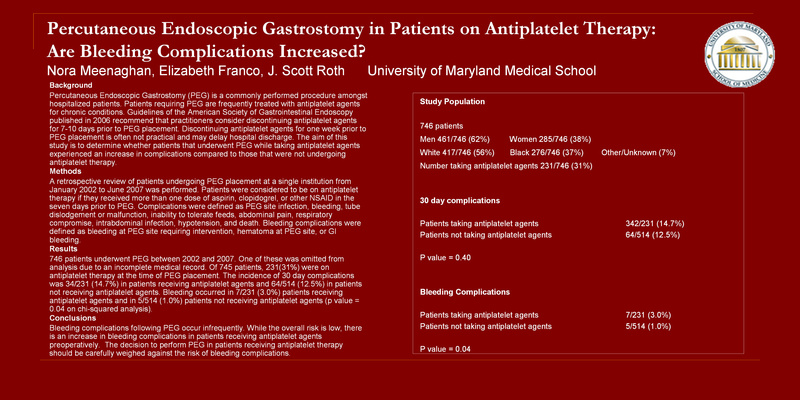 Percutaneous Endoscopic Gastrostomy in Patients on Antiplatelet Therapy: Are Bleeding Complications Increased? Percutaneous Endoscopic Gastrostomy (PEG) is a commonly performed procedure amongst hospitalized patients. Patients requiring PEG are frequently treated with antiplatelet agents for chronic conditions. Guidelines of the American Society of Gastrointestinal Endoscopy published in 2006 recommend that practitioners consider discontinuing antiplatelet agents for 7-10 days prior to PEG placement. Discontinuing antiplatelet agents for one week prior to PEG placement is often not practical and may delay hospital discharge. The aim of this study is to determine whether patients that underwent PEG while taking antiplatelet agents experienced an increase in complications compared to those that were not undergoing antiplatelet therapy. A retrospective review of patients undergoing PEG placement at a single institution from January 2002 to September 2006 was performed. Patients were considered to be on antiplatelet therapy if they received more than one dose of aspirin, clopidogrel, or other NSAID in the seven days prior to PEG. Complications were defined as PEG site infection, bleeding, tube dislodgement or malfunction, inability to tolerate feeds, abdominal pain, respiratory compromise, intrabdominal infection, hypotension, and death. Bleeding complications were defined as bleeding at PEG site requiring intervention, hematoma at PEG site, or GI bleeding. Five hundred ninety-two patients underwent PEG between 2002 and 2006. One hundred eighty-four (38%) patients were on antiplatelet therapy at the time of PEG placement. The incidence of 30 day complications was 24/184 (13%) in patients receiving antiplatelet agents and 54/408 (13%) in patients not receiving antiplatelet agents. Bleeding occurred in 6/184 (3.3%) patients receiving antiplatelet agents and in 5/408 (1.2%) patients not receiving antiplatelet agents (p value = 0.08 on chi-squared analysis). Bleeding complications following PEG occur infrequently. There is an insignificant trend toward increased bleeding complications in patients receiving antiplatelet agents preoperatively. The decision to perform PEG in patients receiving antiplatelet therapy should be carefully weighed against the risk of bleeding complications.